1st: 7-5-6-1-4…Mo Diddley (7) a horse I have been waiting for since I saw him work at Churchill Downs on May 3 (he breezed 4 furlongs in :47 breezing at Churchill). The 2YO colt by Uncle Mo brought $450,000 as a yearling at the Fasig-Tipton Saratoga Sales last August. This legger can motor, gets a good outside post and earns my “dot” (must use) pick in this race. It won’t be a breeze, though. Shangroyal (5) sold for $400,000 as a Keeneland September yearling and is trained by the guru of 2YOs, Wesley Ward. Training well at Keeneland. Steve Asmussen has Red Alert (6), too. But I’ll go 7 to win/place if even money or better; and I key the 7 over the 5-6-1-4 in the exactas. Will bet a $1 pick 3, keying the 7, over all, over 1-3. 2nd: 1-3-2-4…Small field but a tough field, as a handicapper can make a case for any of these. I settled on Whyruawesome (1), who ran a solid race at Keeneland on 4-26-17 in his ’17 debut. Obviously, he needed that and should improve. This gelding gets a higher number on pure dirt. Rider is red hot and he gets the nod here. Medal of Courage (3) is an ultra-consistent true closer, who has hit the board in 25 of 37 lifetime starts. If not for Rhythem Park, he could have two more wins this year. Stormy Pacific (2) likes Churchill and moves up on dirt as well. Bad Student (4) is the hottest of the bunch this year, with two wins and two seconds in five starts this year. I bet the 1 to win/place here and then box the 1-3-2 and the 1-3-4 in the exactas. Tread lightly. 3rd: 1-3-5-6: Din’s Fire (1) is my pick and gets a solid “dot” here in a weak field. Plummets from the MSW ranks to MC $10,000 level for a sneaky trainer/owner. If she can run anything like she trains in the a.m., she should air these from the rail. Abboccato (3) is huge ML favorite, coming off a narrow loss in last out at this same level. Deep closer doesn’t have much speed to run into in this spot. Like a Hint (5) is best of the rest and drops from $20,000. Going to also use Chargers Miss (6) underneath. I’ll bet Din’s Fire to win/place and key over and under in the exactas with the others. Pick 3 starts here with 1/5-7-4-3-2-1/4. 4th: 5-7-4-3-2-1…Another wide open affair here, but I give the nod to the dead closer Whole Lotta Luck (5), who is dropping from $50,000 MC to $20,000 MC. Regular rider gets off, and a cool jock climbs up, and that gives one pause. But this one was nominated to the Triple Crown and has run against the likes of Senior Investment (Preakness entry), and some other good ones. Also, this will be the first time he runs as a gelding. Mizzing Frazier (7) picks up rider Corey Lanerie today and a new trainer, after being claimed last out by Derrick Bright. Moves up in class, but could be competitive at this level, too. Renvyle (4) is another dead closer, but gets a huge rider switch. Cadillac Red drops from $40,000 to $20,000 and that may move him up, too. K L S Forty Three (1) may hang around to get a piece of this one. Rider may send from the rail in a race absolutely void of any speed. I bet the 5 win/place and key over & under with the rest here. Will play the double here with 5-7-4-3-2-1 over the 4. 5th: 4-1A-7…Nice race on a Thursday card. If it stays on the grass, I go with Bondurant (4). Had no chance in the G1 Maker’s Mark in last, especially after parked 9 wide. Still took some betting action that day against some of the best. Ran a huge second to speedster Heart to Heart two back in the G3 Canadian Turf at GP. That race puts this one in the winner’s circle today. Chocolate Ride (1A) is 7YO now and may have a lost a step, but still very classy. Stretched out too far in the last, but gets back to familiar distance today (where he has 3 wins, 1 second and 1 third in 6 lifetime starts). May be the lone speed here, but he’s not a big fan of this grass course. Airoforce (7) could easily win this race today, if he comes off the layoff firing . His barn has a way of getting him ready. This one may be a little short for him, but you have to use. You get the 1 (Special Ops) here, too, if Brad Cox leaves them both in. He is the closer of the entry. I bet the 4 win/place and key over/under in the exactas. My BET OF THE DAY. 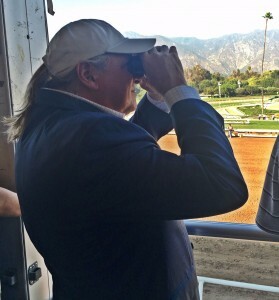 I will key the 4 in the pick 3s going forward: 4/5-3-2-1-8-6/1-6…Double bet with 4 over 5-3-1. 6th: 5-3-2-1-8-6…Heartbreak Hill (5) gets the “dot” in a lackluster field of real contenders. If the daughter of Ghostzapper, who is a dead closer, runs anything like she did in her last, she wins here. Would not be a bad claim for this price. Victory’s Secret (3) is coming off a layoff, but put in a good work at the Churchill Downs Training Center on April 23. Drops way down in class, and, if she is close to ready, could upset at a price. Grace to Glory (2) plummets down the scale, dropping from $50,000 to $16,000. I am leary here. Endless Thyme (1) moves up after breaking her maiden for $10,000 in last out. I definitely can use this filly here for a deadly trainer-jockey combo. Will need to break sharply from the rail, but has speed. I bet the 5 (9-5 fav ML) to win only, but will box the 5-3-2 and the 5-3-1 in the exactas. May root for a 1-3 combo hit at some odds. 7th: 1A-6-9-5-2-1…Red Lodge (1), with the apprentice jockey looking for first win of the meet (has 4 seconds in 6 starts), is spotty, to say the least. But she had to need the last race at Woodbine (which was a tough spot coming off the layoff), and she has talent – having won a stake at Woodbine as a 2YO. Trained well at Keeneland on May 7. May be sitting on a big one. Fort Marsh (6) is an Illinois-bred, but this 4YO can run and may have a bit of a maturity edge on these. Have to use here. Like a Hurricane (9) hooked a couple of real good ones in her last two, and gets a huge class breather today – with a switch to a sprint. Trainer’s record is suspect in three key categories (turf races; route to sprint angle; and the layoff), but this filly may be able to out-run those statistics. I key the 1 in the exactas over (bigger) and under (saver). I bet the 1 to WPS, hoping both that both parts of the entry hit the boad. If they do, the payoff could be nice. 8th: 3-1-11-9-5…Learning Curve (3) gets the “dot” here in the day’s finale. Not much to beat for this 4YO daughter of Super Saver for a red-hot trainer. She can come right back to win again, despite the move up in conditions. Rangers Funny Girl (1) picks up the best rider in this jockey colony and should benefit greatly from the switch. Another drop in class for this one, who appears to prefer synthetic surfaces. Lady Midnight (11) hasn’t raced since 2015, but if she is anything at all like she used to be, she can handle this field off the layoff. This is another one that prefers a different surface type, though. This will be the first time on a dirt track. Leanne N Susan (9) doesn’t appear to be much of a runner, but has a chance in this group. I will key the 3 over and under the rest and bet to win/place.